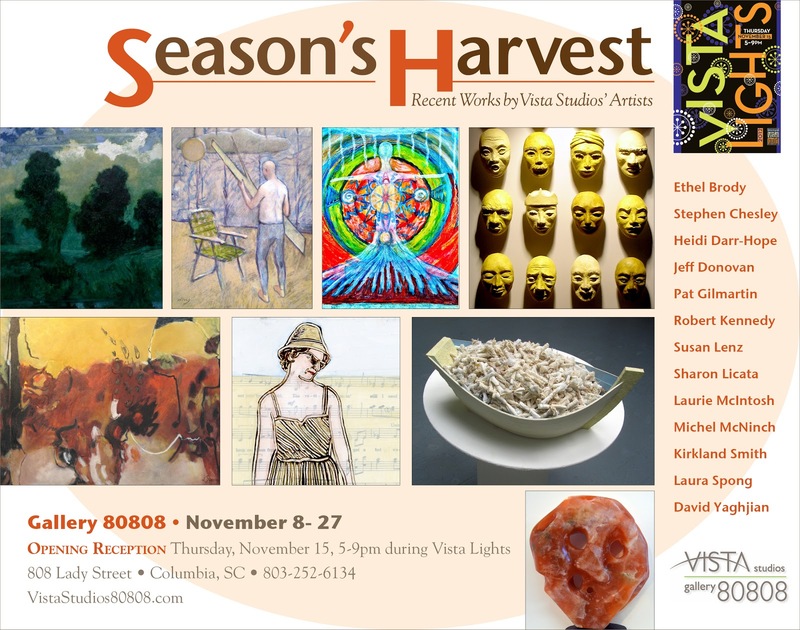 Vista Studio’s 13 resident artists invite the public to view “Season’s Harvest: Recent Works by Vista Studios Artists”, which will be on display November 8- 27, 2012. There will be an opening on the 15th, from 5-9pm, during the Vista Lights Celebration. Come see our new exhibition at Vista Studios/Gallery 80808 located at 808 Lady Street in the Vista. 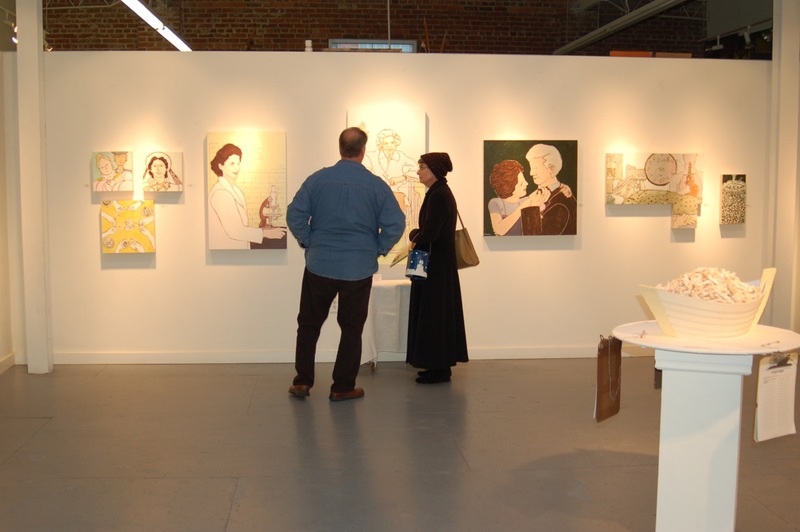 The artists will have their studios open for you to get a look at their newest work and processes. Non-objective painter, Ethel Brody, continues experimenting with structure and color. Taking visual clues from her daily life, she creates colorful, highly organized compositions with strong graphic qualities. Stephen Chesley will have a current piece reflecting his well-known poetic realism documenting the diminishing asset of solitude and historic romanticism in the south. Pat Gilmartin will be showing her newest ceramic sculptures. They include a pair of works comprising multiple faces mounted on a background; each face is unique and individually formed. Lit from above, they create dramatic shadows that become as much a part of the art as the faces themselves. The pieces are entitled “Echoing Shadows.” Gilmartin has also continued to explore her series of blocky, abstracted figures and will have several new ones to show during Vista Lights. Fiber artist, Susan Lenz, will collaborate with Jeff Donovan on a piece that will be presented with several title options with the final naming to be determined by popular vote at the end of the evening, November 15th. They will then christen the artwork, complete with at least one bottle of champagne. 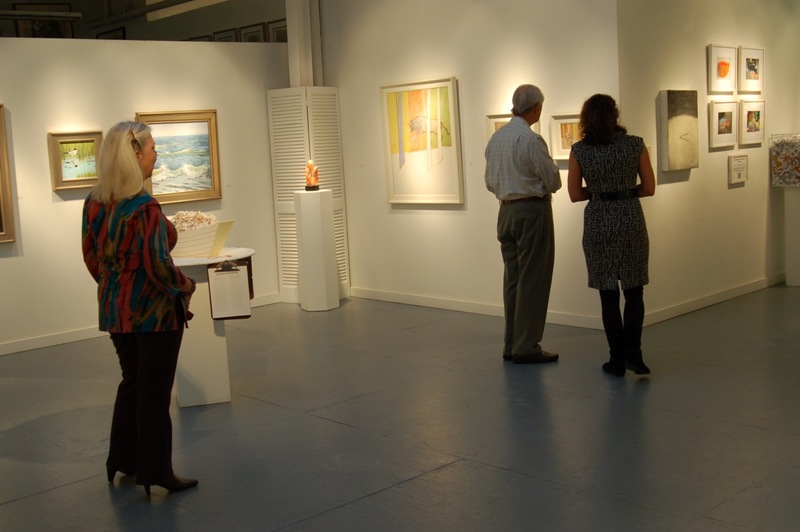 Susan will also be displaying some of her new experimental fiber & epoxy pieces reflecting the surface of wet sand. Sharon Collings Licata, sculptor, will exhibit works using Orange Utah Alabaster. One of her pieces is titled “Two Faced II”. Again the orange faces speak… It’s up to viewer to decide what each side has to say. 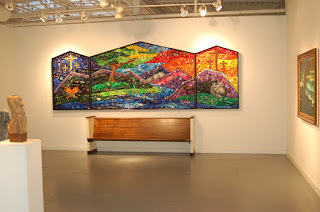 Kirkland Smith has collaborated with the CotA Arts Fellowship and Church of the Apostles members to create a pastoral Assemblage triptych, 15 feet wide and 5 feet high at the center point. Using everyday post-consumer objects collected by church members and the community at large, the scenes depict the life of Christ in a stylized way, representative of stained glass. 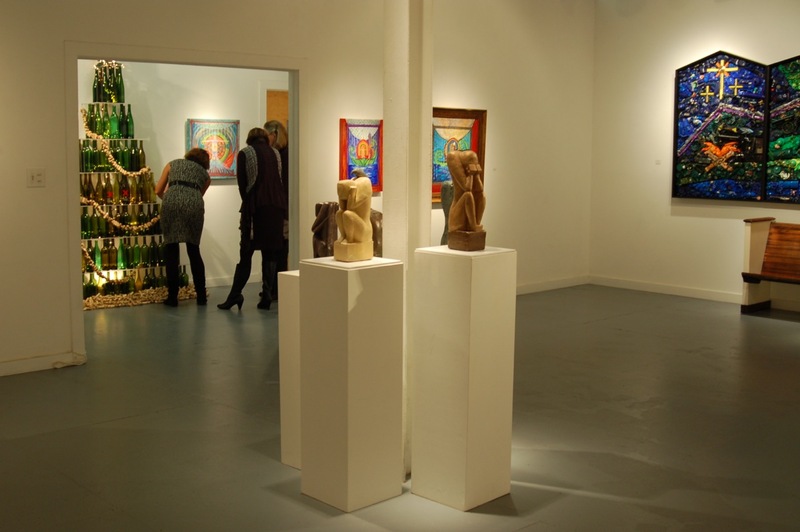 Artists Heidi-Darr Hope, Robert Kennedy, Michel McNinch, and David Yaghjian will also present new work and open their studios at Vista Studios. The exhibition will be from November 8-27th. 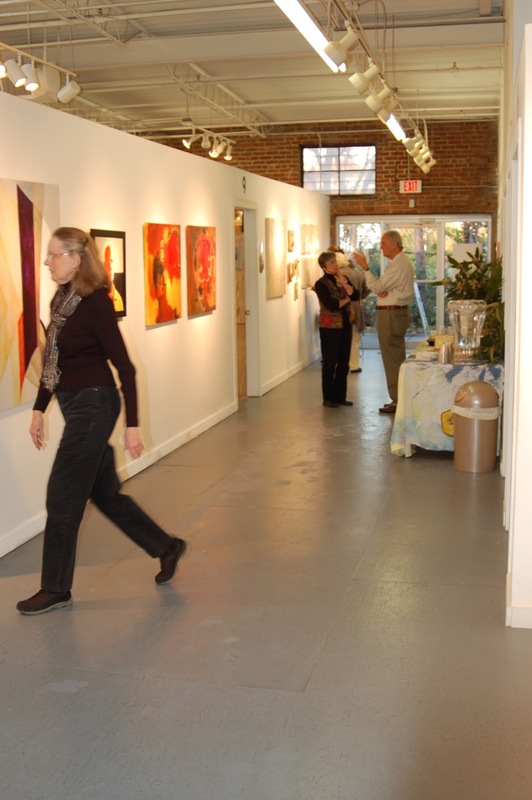 Gallery hours are weekdays 11 a.m. to 3 p.m. and weekends 1-4 p.m. Please call the Gallery 80808 at 803-252-6134 to confirm hours. The website is: www.VistaStudios80808.com.